You've found the “U.S. Dorking Chicken Breeders” page here at Hobby Farm Wisdom! If this is the first time you have visited our site: Welcome! Dorking chickens are an extremely old breed of chickens believed to be originally from Italy. Historically, they are mentioned as far back as the Roman Empire under the rule of Julius Caesar. They are one of the oldest English breeds as well, having been imported to Britain around the time of the Roman conquest. 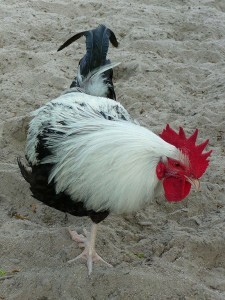 The Dorking have a distinct appearance in their square body with short legs and five toes. Traditionally Dorkings were red but that variety has now become one of the rarest breeds. Today the pure white, dark, silver grey and cuckoo varieties are more popular. While they are a seasonal egg layer, these birds are well known for the gourmet meat they produce. Dorking meat is said to be sweeter and better tasting than other breeds. However, they are not overly popular due to their poor egg production and inability to fare well in cold weather.